A Marine searching for serenity. Fernando “Nando” Santini has a lot to live up to being the youngest in a family of Marines. He has only ever wanted to be a Marine, until his last deployment. Since he returned, he’s suffered from nightmares and sleeplessness that has him ready to try anything. When his cousin’s wife suggests massage therapy, he jumps at the chance to try something new. A woman who lives to heal others. Sunshine Foster has always marched to the beat of her own drum. Raised by a single mother, she’s had her share of hardship and pain. She became a massage therapist and reiki master to help people heal, including quite a few military personnel suffering from PTSD. Right from the start, she knows Nando is different from her other clients. She can’t seem to keep a professional distance she’s never had a problem with before him. Almost immediately, Nando starts to realize that she is the woman for him. Sunshine has dealt with clients who fall in love with her before, but her feelings for Nando are far from normal. One kiss has her falling for him and soon, they are involved in a red hot affair. But Sunshine is keeping a big secret from Nando, one that could destroy their budding relationship. When it is revealed, he will just have to prove to her that once a Santini falls in love, there’s no changing his mind…or his heart. Nando came awake in a rush, his lungs on fire. He gulped in huge breaths as he tried to calm his racing heart. He didn’t even try the breathing and counting exercises his doctor had given him. He was concentrating on trying not to pass out. His heart started to calm, and his brain caught up with the panic attack he had been having. He started using the counting exercises—counting numbers in the wrong order—to get his brain back on track. The one thing he had learned in the last few months was that he could deal with just about anything if he took a moment and remembered where he was. PTSD. 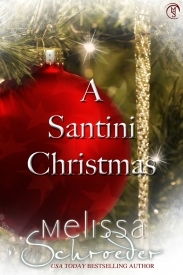 It wasn’t something the Santinis were unfamiliar with. His sister-in-law had dealt with it, as had his brother Carlos. Both of them had reacted differently to it. Madison hadn’t been able to work as a Marine anymore, and his brother…well Carlos became a thrill junkie. Thankfully, Carlos had found his mission in life and now operated the ranch in Arizona that had helped him. Madison was a yoga instructor and had even given Nando a few helpful routines. They had, but every now and then, he’d have a nightmare that he couldn’t truly remember, except for the panic that forced him out of it. It was bad but wasn’t severe enough that Nando felt he had to leave the Marines. He glanced toward the window. It was still dark outside, so he knew it was the middle of the night. Night was always one of the best times in Hawaii. Of course, his brother Anthony said anytime was always a good time in Hawaii, even in a hurricane. With a chuckle, he slipped out of bed. After a quick trip to the bathroom, he grabbed some water and headed outside. He was lucky enough his cousin Marco had married a local girl, one with a stunning home right on the water. There was a guest house that various Santini friends and family had rented from her through the last few years. Hoping he didn’t disturb anyone, he walked passed the front door and headed to the pool behind the house. His senses went on alert as he saw a figure by the pool. Alana. His cousin’s wife had been having a hard time since Marco had deployed. He thought about leaving her alone, but he must have made a noise and she turned around. “Nando,” she said, a welcoming smile. His cousin had definitely hit the jackpot with Alana. She was sweet, smart, and beautiful. It also helped that she didn’t put up with any crap from Marco. He knew it wasn’t easy being married to a Santini. He nodded and joined her at the table. She sat down, and he took the opposite chair. There was a baby monitor on the table. He shrugged and took a big drink of water. Her voice was filled with understanding, making him feel like a heel. She was only trying to help, and he knew from what his therapist told him that he needed to stop internalizing. “True,” he said. His oldest brother had fallen for another military brat with local ties. Alana took full credit since she’d introduced them. Then she looked in the direction of the beach. He knew she was probably thinking about Marco. Since his cousin was a SEAL, they never really knew where he was in particular. Alana had been strong, but he knew the nights could be tough. She giggled, then it faded again. He chuckled, but he hadn’t been lying. He hadn’t really had a date in almost a year. He didn’t count hookups. A bona fide date with dinner or something. “Organically?” she asked, her voice quivered. He studied her and even in the dim light he could see her eyes were dancing. He shrugged. He’d had his share of dates in high school and throughout the academy. There was one girl he even talked marriage with, but for some reason, nothing stuck. At the moment, he wasn’t even worried about marriage. Sure, he was close to thirty, but he still had time—a lot of time. Also, there was the problem with his career. While his PTSD didn’t keep him from serving, he wasn’t sure he wanted to spend twenty years in. He’d started to enjoy the work he was doing right now, even though he knew he was expected to go back into the field. Without a secure future, he couldn’t get serious about any woman. “Hey, I’ll hang out and help. I got my PT done yesterday, so I don’t have to be in until seven-thirty. Then she walked off. He watched as she disappeared into the house. He turned to look out to the ocean. The house sat close enough to hear the surf, and he liked that. He liked a lot of things about Hawaii, more than he had expected to. He was enjoying this assignment, so there was no reason to screw it up with dating. Right now, he was happy just to be the way he was. Serious relationships and dating could come later. Sunshine Foster sighed as she parked her car behind her shop. Nothing like a car wreck at the turnabout to cause her to run forty minutes behind. If she had gone with her instincts and taken Haleiwa Road, she would have avoided it. Once she got stuck there, there was no moving anyone. Throw in the fact that she had overslept, and it was not a good start to the day. “Hey, Sunshine,” Mary, her receptionist, said as Sunshine blew into the room. “Haole,” Mary said, using the term Hawaiians used for newcomers. Mary was Hawaiian and was convinced Sunshine was too; although, she was as white as a girl could get. With her red hair and freckles, she was probably the furthest thing from Hawaiian a girl could get. The old argument was getting worse now that her father was stepping up his calls. She didn’t know why it was so important for him to see her now. He’d never seen her in her life, so there was no reason to start now that she was twenty-six. Mary nodded, and Sunshine headed back to her office. “Hey, Alana, what’s going on?” she asked as she closed the door and dropped her purse on the chair next to her desk. “Probably,” she said, a smile in her voice. Sunshine felt like a heel. She should have been checking up on her friend. Being pregnant and having two kids was hard enough. “Not that you are counting,” she said with a chuckle. She adored Alana—hard not to when she was such a sweetie—but she was also very envious of her life. Marco adored Alana. Sunshine wondered how that felt. Sunshine was mainly a pescatarian—a vegetarian who sometimes eats fish. They hung up and Sunshine looked at her schedule. It was odd that she didn’t have a later appointment, but it was as if the Fates wanted to make sure she made it to Alana’s today. Of course, the Fates worked for that. She’d been raised to believe in them, even though she excelled at science. Her mother, though, believed that things worked out the way they were supposed to. Unfortunately, the Fates apparently only cared about Sunshine’s career. Her love life, that was another matter. That had been as barren as life on the Moon. Well, not always, but the last year had been kind of boring. Add in one irritating customer getting a little too attached to her, she had really been through the ringer. Sunshine knew she needed to date again. It was just so hard to find a good guy. Her work schedule didn’t help. She’d only had the shop for eighteen months. In that time, she had saved every penny she could to put back into the business. Just last month, Mary had convinced Sunshine to stop seeing customers on Sundays. She worked only six days a week. Now, though, she spent Sundays cleaning her house and crap like that. The idea of getting dressed up and going out with a man just didn’t appeal to her these days. How are you going to meet your fate unless you try? Her mother’s voice echoed in her head. She snorted. If the Fates were so damned good at their job, they would throw a man in her path. Mary left, Sunshine stood then grabbed her lotion holster. The name of the belt she wore to hold her lotions always made Sunshine smile. After grabbing the two lotions she would be using for the treatment, she slipped them into their slots, then she slid it around her waist clipping it. She might not have help with her romantic life from the Fates, but they were doing a great job with her business. And for now, that was enough. Beautiful story from a great writer.